Sometimes I wonder what it would be like to live in the 40's, 50's or 60's... Mostly because of the then true classy, ladylike fashion. I've always loved the utterly feminine look and happily the hit tv show Mad Men has brought back attention to this way of dressing. We see different designers have picked up the vintage look again and so even the more affordable brands like Zara, Topshop or H&M now have pretty long skirts and dresses in their latest collections. I couldn't be more happy! Here's a little visual reminder of the gorgeous 50's vintage beauty. How do you feel about the utterly feminine look? 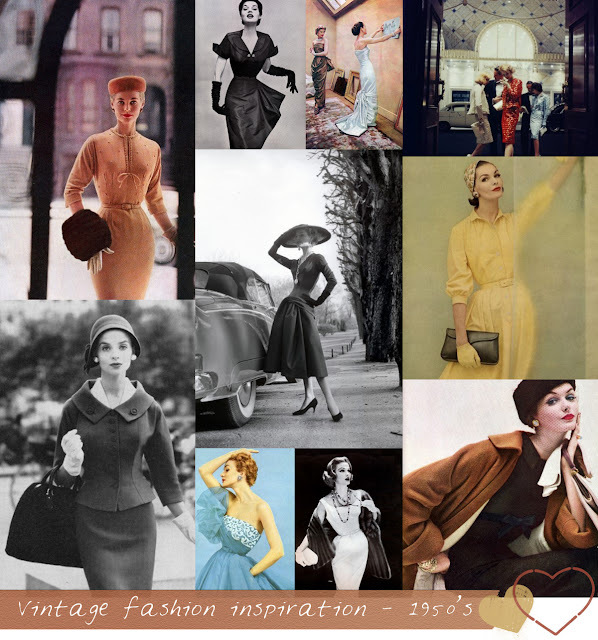 I love fashion from the 40's.-50's. It's so feminine,simple but still elegant. You're right that in such vintage clothes a woman looks like a true lady. And I love that look. As you know, I'm a BIG fan! If only EVERYONE would start dressing this way again, the world would be so much prettier!